I have to admit I am very, very jealous of people that have thinner eyebrows. I’m always amazed when someone comments on here to tell me that my brows are lovely. WHAT!? Seriously? Are they being sarcastic or do they really mean that? I’ve always wanted to be that girl that had to fill her brows. But I’m not. Filling is absolutely unnecessary in these parts because I have full, dark (out of control) brows! I’d recommend reading my Benefit Brow Bar Experience if you want to hear about that one time my brows were filled. Horror Show! Anyway, no matter how much I groom my brows, no matter how good a shape they are, I always, always have fly away brows. They just don’t love staying put. I use a variety of products to tame them but my favorite is by far is…. Rosebud Salve. Yup, I use it on my brows. I keep a pot solely around that I use on my eyebrows (you really don’t want to use it on your lips and your brows in my opinion). Keep in mind a little goes a very, very long way. You can just dab a small amount onto a Q-tip and swipe it gently across your brows to keep them in place. Or if you have a little spoolie brush that works too. My outer brows are the worst as they tend to shoot up in the air or they wisp down by my highbrow area. So, I tend to keep application to my outer brow area. I just smooth it on and my brows stay put all day. Plus I have drier skin so, at the end of the day the area where I applied the salve is nicely hydrate. It also removes easily, just wipe off with a tissue at the end of the night! So, yup, using Rosebud Salve as a cheap brow wax works a treat for these unruly brows. Yes, You Can Use Your BeautyBlender To Apply Skincare! Really and truly you don’t want to be the girl that has to fill in her brows! I dunno Dee! Sometimes I wish I had thin brows! I have the same issue with my own eyebrows. My mother is very envious because hers are pencil thin and she says I lucked out and inherited my fathers bushy brows. I don’t feel very lucky though because they’re such a hassle to groom and every morning they look like fuzzy caterpillars on my face. I like to use NYX Eyebrow Shaper. It has vitamin E so it conditions the area pretty well. I’d do anything for thinner brows. I hate mine 🙁 I feel your pain Olivia! I have keep my hands on them less I’m walking around with a unibrow! I’ve always hated mine 🙁 I wish they were just perfectly shaped and thin! no luck! They are out of control ha! l’Oreal’s brow sculptor is the best brow setting gel I’ve ever used. Oooooh great tip! 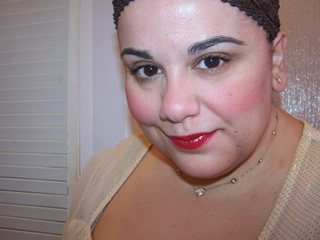 I have a decent, middle-of-the-road brow shape if I don’t go overboard with plucking/threading, but curly brow hairs. So I feel ya on the pain of taming them! I typically use the ABH Brow Gel but I’m going to try this! :(. This makes me look like an alien with my rounder face. When I do fill in brows they take about 10-15 minutes alone. Haha there’s no such thing as makeup in 5 minutes for me. Believe it or not, I also use rosebud salve on my brows, and have done so for years! Hate all you want. But as you get older they go away :(:( I had beautiful full eyebrows. Now I have to fill them in and not happy about it. I remember reading about your experience at Benefit’s Brow Bar and had a good chuckle. I was considering going there myself, but after I read about what happened to you, I chickened out. I have slightly thick, grey eyebrows and when I have tried to “fill” them in the results have been disastrous. I just use a light brown pencil and that works for me. haha it was a mess 😀 They overfilled my brows to the max!